The meeting: what to say, what not to say, tips, resources, etc. Myths about vaping that need to be dispelled. MPs are not going to know that there is anything wrong with Bill S-5 unless you tell them. Personal meetings are proven to be the most effective way to persuade decision makers (far better than phone-calls or letters). As a business owner in the MP’s riding your opinion carries more weight than others. You are a leader in your area. You should set up a meeting with the MP(s) of any ridings where you have a business location as well as the riding you live in. Call the MP’s office during normal office hours. The number can be found on their website. Do NOT just communicate your position to the person who answers the phone. You are a business owner in the MP’s riding — you can get further up the chain than a normal person. Be polite & respectful with every person you speak to. Say “thank you” a lot and thank them for their help even if they aren’t helpful. Your MP is busy. They probably don’t know much about vaping. You do not have a lot of time to go through every detail of Bill S-5 or the vaping industry in this meeting. the topic. Give them a BRIEF background on vapour technology and the vapour industry, which they likely don’t know much about. The second goal is to get the message across that Bill S-5 is a grave threat to your business and your ex-smoking customers. Bill S-5 would make it illegal to truthfully tell customers that vaping is less harmful than combustible cigarettes. It makes it illegal to share peer reviewed science with customers. Bill S-5 would severely diminish access to low-risk, smoke-free products that are being used to reduce the harm from smoking. 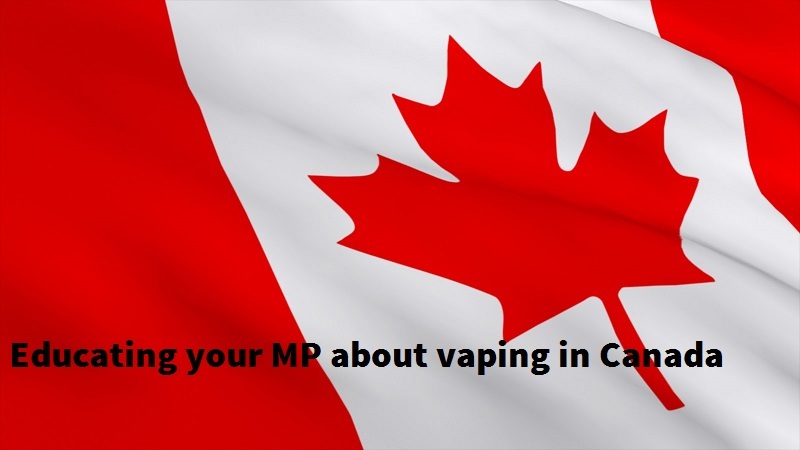 Explain to your MP that the variety of e-liquid flavours and devices is vital to helping people switch to low-risk products and stay smoke-free. Bill S-5 would ban most of the popular flavours that are helping people stay smoke-free. Bill S-5 will likely eliminate many or most of the products you currently sell and bring in regulations that are extremely burdensome for small businesses. It will likely result in American tobacco companies moving in and taking over the entire market while independent Canadian businesses will be forced to close. Bill S-5 has drawn criticism from constitutional experts and public health experts in Canada. Explain to them that you support reasonable regulations for products. Things like minimum age for purchase, child-resistant packaging, informative labelling, product standards, etc, are important to the industry, and that the industry has voluntarily adopted standards on its own in the absence of federal regulation. Bring samples of the kinds of products you sell that your MP can handle and look at if they are interested. They need to see that the products are already regulated as consumer products. Important: Your MP is probably not aware of the difference between the vaping industry and the tobacco industry. They are likely unfamiliar with what goes on in a vape shop, and the role you play in helping your customers switch. Explain to your MP that tobacco companies answer to transnational shareholders. Vape shops, on the other hand, answer to their ex smoking customers. DO NOT express an opinion on politically contentious issues like whether or not it should be legal to sell to minors. If they ask you about it, you should reply that you follow what the law says. You should also note that data from Statistics Canada shows that regular use by adolescents is extremely rare. DO NOT say ANYTHING negative about the industry or other vaping businesses. Keep the interaction positive, except for your message which should be that this will put you out of business if it passes. Politicians don’t distinguish between you and the rest of your industry. Anything bad you say about other businesses will reflect on you. DO NOT bring up problems that they don’t mention (even if you’re offering solutions to those) . DO NOT try to negotiate regulations with your MP. All they need to know from you is that what is on the table is bad, except for common sense regulations like restrictions on sales to minors and child-resistant packaging. Other facts about your business. Do a little bit of studying yourself so that you can come back with answers if asked. It is vital that immediately after your meeting with your MP, you follow up. Send a thank you email to your MP’s office. Thank them, and any staff you interacted with for their time. Mention you will be in touch. Send a follow up letter to your MP summarizing the key problems for your business, for you, and for your employees. Offer to be a resource for any future questions they have. Remember: the meeting is the first step in what will hopefully be a productive relationship with your MP. Myth: Bill S-5 will make vaping products available to adults for harm reduction. • Reality: The bill makes nicotine for e-cigarettes legal. But along with this “legalization” comes a regimethat could easily make many if not most products available on the market today illegal. E.g. it banscurrently legal zero nicotine flavoured e-liquids (dessert/drinks/confectionary) & hardware testingrequirements & document are not specified: there is no guarantee that companies will be able to affordthese requirements. Myth: Bill S-5 establishes reasonable regulations. • Reality: by and large, the regulatory regime treats vapour products as though that are the same ascigarettes. BUT regulation should be proportionate to risk. Considering that vapour products are not likelyto exceed 5% the risk of smoking, treating vapour products like cigarettes is wildly inappropriate. Myth: Bill S-5 will not affect “responsible” businesses that only sell to adults. • Reality: The entire independent industry is deeply threatened by Bill S-5. That Bill S-5 is balanced. • Reality: There is no formal harm reduction mandate in the bill. The legalization of nicotine containing ecigarettes is being used to give the impression of “liberalization” yet the formal justification for theregulations in the bill is based in gateway mythology. The existence of the entire vapour industry is atstake. Moreover, Bill S-5 will likely create a new black market for several products that are currently legal. Myth: Flavours exist solely to attract adolescents to a lifetime of nicotine addiction. • Reality: Flavours (even candy and dessert) are extremely important to adults’ smoke free journey (see e.g. Farsalinos et al 2013). It is overwhelmingly adult smokers and ex-smokers, that buy and use these products to reduce harm and prevent “relapse” to cigarettes. • Reality: According comprehensive evidence reviews by prestigious health groups and medical organizations like the Royal College of Physicians, E-cigarettes are unlikely to pose more than 5% of the risk of combustible cigarettes. • Reality: Nicotine without smoke is a proven method of stopping smoking. Vaping is proving much more popular than NRT as a substitute and competitor for tobacco cigarettes. “E-cigarettes appear to be effective when used by smokers as an aid to quitting smoking” (Royal College of Physicians, 2016). Myth: The vaping industry is marketing to youth. • Fact: The vapor industry is driven by consumer demand. Vapor consumers are almost entirely adult smokers and former smokers seeking a low-risk alternative to cigarettes. Given the large existing pool of consumers (smokers), there is absolutely no motivation for vapor businesses to target marketing to young people. In fact, according to 2015 Statistics Canada data, 15 to 19- year-olds reported NO DAILY USE of e-cigarettes. Among the same age group, only 5% reported OCCASIONAL use. Myth: The vaping industry is the tobacco industry or behaves like the tobacco industry. • Fact: The vapor industry in Canada is predominantly small, independent businesses established and run by former smokers who switched to vaping. Recent Canadian survey research by Shiplo et al (2017) found that current of e-cigarettes use is almost entirely concentrated among smokers. • Fact: Reasonable regulations are important to the industry, and that the industry has voluntarily adopted standards such as minimum age for purchase and child-resistant packaging, ingredient listing, and warning labels, on its own in the absence of federal regulation. Overly restrictive regulation will drive consumers to the black market and expose them to unnecessary risks. Myth: Youth are attracted to e-cigarette flavours. • Reality: There are numerous editorials and commentary about this but little evidence to back up the claim (O’Leary et al 2016). Sweet flavours have been around for some time in Canada yet data show that youth do not regularly use e-cigarettes. A US experimental study showed that abstinent teens exhibited almost no interest in trying vapour devices, regardless of flavour (Shiffman et al 2015). O’Leary, R., MacDonald, M., Stockwell, T., & Reist, D. (2017). Clearing the Air: A systematic review on the harms and benefits of e-cigarettes and vapour devices. Victoria, BC: Centre for Addictions Research of BC. This is a working document intended to provide practical advice to Canadian vendors on meeting with their MPs about Bill S-5. It was created by Amelia Howard, a PhD candidate in Sociology at the University of Waterloo who studies the impact of regulations on the independent vape industry. She is also an independent, unpaid advocate for vaping which she believes is a promising solution to smoking harms in Canada. Amelia has no financial interest in vaping, receives no commercial funding for her research or advocacy work, and was not compensated by anyone for the creation of this document. She is solely responsible for the contents of these slides, including any errors. Thanks to Alex Clark (CASAA), Jim McDonald, Gillian Golden (IVVA) and Thomas Kirsop the American Vaping Association and others who provided resources, advice and feedback. Excellent resource for businesses. Now what about individuals? I, too, as a private citizen, would like to have a say in how these vaping laws are formed. Is there a document available for vapors in Canada to fill out that do not work in the industry to contact their MP’s? Or a petition we can sign? 1. Contact senators (as soon as possible). Canada’s Bill S-5 has gone through second reading in the Senate and is now referred to the Standing Senate Committee on Social Affairs, Science and Technology for study. As a consumer, you are an expert in these technologies and how they helped you and your perspective should be considered. I recommend sending a letter to each senator on the committee (list is available here: https://sencanada.ca/en/committees/soci/). -> the importance of flavours and flavour choice to consumers. They are set to ban large swaths of flavours. Consumers should let them know that this forces us (I’m a consumer too) to have to either choose from a small selection of products, or go to the black market. -> how important it is for consumers to get accurate information on the relative risk of products. -> how forcing new vapers outside around smokers could cause some to keep smoking. Personal stories work. Tell yours. Say why you were successful with vaping, if you’d tried other ways to quit smoking and why this worked, and really, how the new law could prevent others from having your success. Importantly, you can mail these letters to senators postage free. I would definitely recommend sending one copy to each senator by email AND in the mail. This should be done ASAP. In my opinion, the message they need to hear is that legalizing nicotine for vaping is good, but not if it means breaking everything else and making currently legal products like flavoured e-liquids illegal, or stopping consumers from knowing what they are buying, how to use it, and that it is reduce-risk. In terms of contacting MPs, you may be able to get a meeting but possibly not. What you definitely want to do is call the office AND write a letter (that you’d mail postage free, and send via email). Again, you want to tell your story, be honest, personal, polite, and be very clear about the parts of the bill (e.g. flavour ban, use ban) that put you and other smokers who need to switch at risk. 3. Get your friends and family to be contacting their MPs, as well, also by calling and writing MPs (again, I’d wait until the study in Senate is done so you have a current version to respond to – and watch this space for an update for consumers). 4. Another thing you can do right now is reach out and talk to vape shop owners. Bring them a copy of this guide, or ask them what steps they have taken towards advocacy. Many aren’t aware that the bill is as damaging as it is, or they are uniquely more likely to get actual facetime with MPs as business owners. If you have a good relationship with vape shop owners too, and have the time, you may suggest they bring you along to a meeting with their MP, so you can give a specifically consumer perspective. Failing that, it’s always good to contact any vape shops you know of and try to make sure they know they should be “lobbying”, and that it is important to you, as a customer, that they fight for better regulations. There are probably going to be lots of petitions circulating – and while I don’t want to discourage signing them, there are much better and more effective ways to advocate as an individual. So – sign any petition you want, but more importantly… all of the above can make a real and meaningful difference that will resonate with decision makers. So… that’s a little on the fly and I hope to have something out soon – but hopefully that gives you a place to start.